The Northern Territory is a truly vast and wonderful part of Australia, and Darwin provides an excellent base for possible day trips to some of its very best attractions around its 'Top End'. Possible day trips from Darwin include excursions to Berry Springs and its Territory Wildlife Park, Humpty Doo and the Litchfield National Park. Further afield from Darwin, although still very much deserving a mention, are the outdoor attractions at the Kakadu National Park. Further still is the significant tourist-friendly destination of Katherine, although this town is really just too far for a day trip to be practicable. Berry Springs is approximately 45 km / 28 miles south of Darwin and is often considered to be a suburb of the town, due to its relative proximity. During the Second World War, a weir was constructed across Berry Creek, in order to create an area suitable for swimming for the troops. Today, this swimming venue remains a popular attraction, outside of the wet season. Berry Springs is also where you will find the Territory Wildlife Park, which was established in the late eighties by the Northern Territory Government Parks and Wildlife association, and boasts treetop aviaries, a natural lagoon, a walk-through aquarium and regular presentations. The Territory Wildlife Park is divided into three distinct zones - the Monsoon Vine Forest, the Wetland, and the Woodland - each of which has something quite different to offer visitors. A small and attractive town sited directly to the south of the Arnhem Highway and roughly 42 km / 26 miles to the south-east of Darwin, Humpty Doo can easily be reached in under an hour by car. Although the attractions of Humpty Doo are by no means extensive, there are some definite highlights, such as bird watching at the Fogg Dam, the seasonal crops of mangos, and the giant statue of a crocodile with boxing gloves - named the 'Big Boxing Crocodile'. In recent years, Humpty Doo has enjoyed much commercialisation, with the arrival of a shopping centre and improved local facilities. The Kakadu National Park is roughly 180 km / 112 miles to the east of Darwin and stands within the Alligator Rivers region, where it covers a staggering 19,800 square kilometres / 7,650 square miles. Being so spread out, the attractions within the Kakadu National Park are somewhat scattered around. Worth looking out for is the Bowali Visitor Centre next to Jabiru, the Warradjan Aboriginal Cultural Centre and Yellow Water Billabong in Cooinda, the Twin Falls at Arnhem, the Gunlom Plunge Pool off the Kakadu Highway, and the much-visited Nanguluwur, Nourlangie and Ubirr Aboriginal rock art galleries. With the exception of Tennant Creek, Katherine is really the only sizable town to speak of between Alice Springs and Darwin. 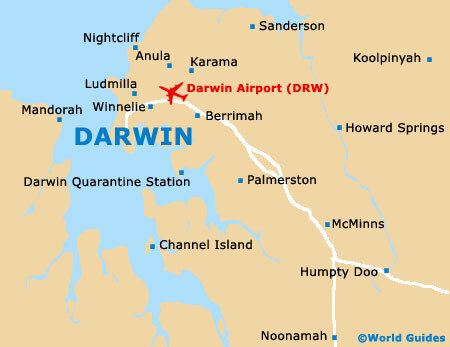 Katherine is located some 317 km / 197 miles to the south-east of Darwin and is home to a population of just under 10,000 residents. Now very much a popular attraction in its own right, the town lies alongside the meandering Katherine River and offers an array of adventure activities, such as bush walking (tramping), canoeing and fishing. During the busy dry season, the Katherine Gorge becomes something of a crowd puller, while the neighbouring Nitmiluk National Park and Jatbula Trail are also both worthy of a mention. Campers will find a good selection of camp sites scattered around the Katherine area. The Litchfield National Park is brimming with recreational activities and attractions, and is just 70 km / 43 miles south of Darwin, meaning that day trips here are very feasible. Those headed for the Litchfield National Park can expect to find beautiful cascading waterfalls, crystal clear plunge pools, giant termite mounds, old settlement sites, endless Northern Territory flora and fauna, and some striking eroded formations of sandstone - nicknamed as the 'Lost City'. Particular attractions include the Wangi Falls picnic area and campsite, and the nearby Adelaide River Township. Many visitors come to the Litchfield National Park to enjoy a refreshing swim in the inviting pools, since crocodiles are said to be less of a threat than in other parks, such as the Kakadu National Park.